Virtual Reality, also known as VR, presents a brand new tool for training future war-fighters. 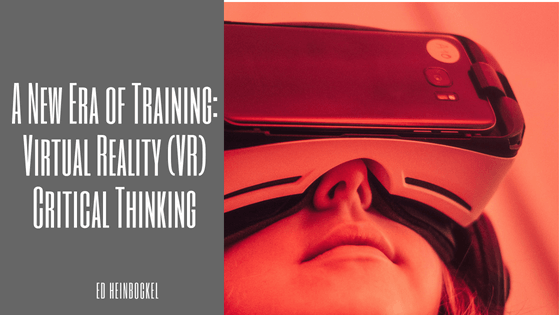 With the increasing popularity of VR and the development of immersive 3D, cutting-edge critical thinking training is an innovative new method of training that allows full immersion to a military trainee and ultimately enables them to ‘think like the enemy. With Visual Purple simulations, critical thinking points are taught through several tactics including cognitive biases, human factor profiling, reasoning styles, decision-making styles, and teaching cooperative skills between various groups and units in order to improve operational effectiveness. Training should never be one-size-fits-all. Customized training experiences with individualized feedback teaches the trainee to take a complex problem apart and put it back together to derive new and deeper meaning. The Army, Navy, Air Force, and others have all adopted virtual, 3D training in recent years. It is used for flight simulation, battlefield simulation, and more. These 3D trainings enable soldiers to learn the best ways to react, without the real-world fears of injury or even worse, death. A serious game is an applied game used for something other than entertainment. There are certain disciplines where true development would be extremely limited without the existence of serious games. On the other side of this spectrum, serious games can be used in conjunction with post traumatic stress disorder treatment. By allowing soldiers to be immersed in a “safe environment,” they can put the new skills they’ve learned to the test. The U.S. military’s mantra is “train like you fight,” and now, that is an actual reality. Military members have the ability to be placed into an immersive training environment. This form of training has become especially effective because many young military recruits are digital natives and therefore find this simulation technology second nature. Virtual environments aren’t new, but virtual reality (VR) is, and VR training programs are quickly becoming a preferred training method. Whether considered as reality or futuristic, VR has the unique ability to place a trainee within an immersive virtual environment to experience a myriad of realistic situations without the real-world risk. Robust training opportunities allow for a higher user/ trainee interaction and a higher retention rate when compared to traditional training methods.